wife of Gottlieb and their infant who died Aug 1848. Both were interred in this cemetery. cared for the KLEEMANN children and in 1838 married Friedrich. They raised a further 9 children. Gottlieb and Karoline had 6 children: Johann Gottlieb, Edmund Godlich, twins John and Ferdinand, Maria Margarethe and the infant. Life on Kangaroo Island was very difficult in 1841. After the S.A. compant closed its operations, only 71 people remained here. By 1849 Karoline and the infant aged 8-10 months had died of starvation. Gottlieb and the children were in poor health. Magdala near Wasleys. 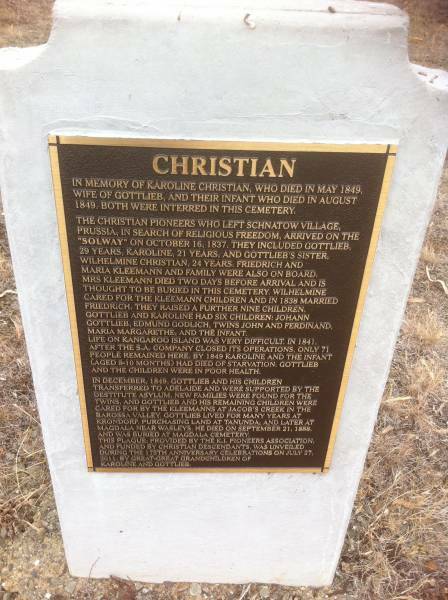 He died on Sep 21 1888 and was buried at Magdala cemetery. This plaque provided by the K.I. pioneers association, and funded by the CHRISTIAN descendants was unveiled during the 175th anniversary celebrations on Jul 27 2001 by great great grandchildren of Karoline and Gottlieb.